Yet another update on the design for better compability! Update to Twitter Bootstrap v2.3.1 from v2.2.1. Minor release to add carousel indicators, improve tooltips, improve dev setup, and fix bugs. Local instead of global dependencies for our makefile and install process. Now getting started is way easier—just runnpm install. Upgraded to jQuery 1.9. No changes were needed, but we did upgrade the included jQuery file to the latest release. Moved changelog to be within the repo instead of as a wiki page. Added carousel indicators! Add the HTML and it automagically works. Added container option to tooltips. The default option is still insertAfter, but now you may specify where to insert tooltips (and by extension, popovers) with the optional container parameter. Improved popovers now utilize max-width instead of width, have been widened from 240px to 280px, and will automatically hide the title if one has not been set via CSS :empty selector. Improved tooltip alignment on edges with. Improved accessibility for links in all components. After merging, link hover states now apply to the :focusstate as well. This goes for basic <a> tags, as well as buttons, navs, dropdowns, and more. Added print utility classes to show and hide content between screen and print via CSS. Updated input groups to make them behave more like default form controls. Added display: inline-block;, increasedmargin-bottom, and added vertical-align: middle; to match <input> styles. Added .horizontal-three-colors() gradient mixin (with example in the CSS tests file). Added .text-left, .text-center, and .text-right utility classes for easy typographic alignment. Added @ms-viewport so IE10 can use responsive CSS when in split-screen mode. 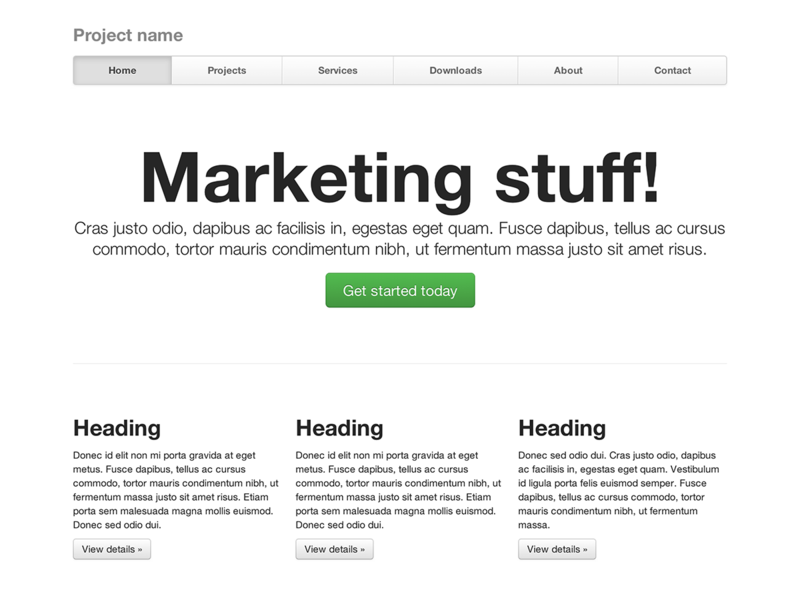 Added new justified navigation example. Added sticky footer with fixed navbar example. Assets (illustrations and examples) are now retina-ready. Replaced Placehold.it with Holder.js, a client-side and retina-ready placeholder image tool. Dropdowns: Temporary fix added for dropdowns on mobile to prevent them from closing early. No longer inherits font-size: 0; when placed in button groups. Arrows refactored to work in IE8, and use less code. Plugin no longer inserts popover content into a <p>, but rather directly into .popover-content. Labels and badges: Now automatically collapse if they have no content. Tables: Nesting support with .table-bordered and .table-striped greatly improved. Now inserts dropdown menu after the input instead of at the close of the document. Hitting escape will place focus back on the <input>. Print styles, from HTML5 Boilerplate, have been added.